This Wiveton Summerhouse has recently been installed in Nottingham. 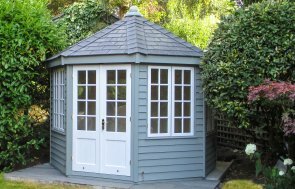 At 1.8 x 2.5m in size it is one of the smaller Summerhouses, which was ideal for the customer who wanted to host intimate social gatherings. The roof was made with cedar shingles, which are extra protective and will gradually turn into a elegant silver colour. The shiplap cladding was finished with Sandstone from our Valtti paint range. The interior has a painted matchboard lining and a light oak lacquered floor. So the summerhouse can be used all year round, the roof and walls were fully insulated. An electrical pack with a heater was also included. 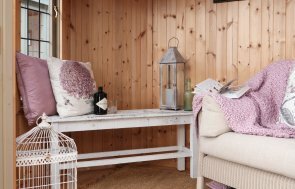 All of our garden buildings are made using the finest Scandinavian timber, sourced from a reliable partner mill where the timber is sustainably managed. 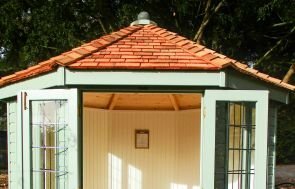 We design and install a wide range of luxury Garden Buildings. You can see all we have to offer by visiting one of our seven UK National Show Centres. Delivery and installation comes free as part of our end-to-end service. If you have any questions, you can Request a Callback, Contact Us, or call us directly on 01760 444 229.